Can High Blood Pressure Cause a Miscarriage? 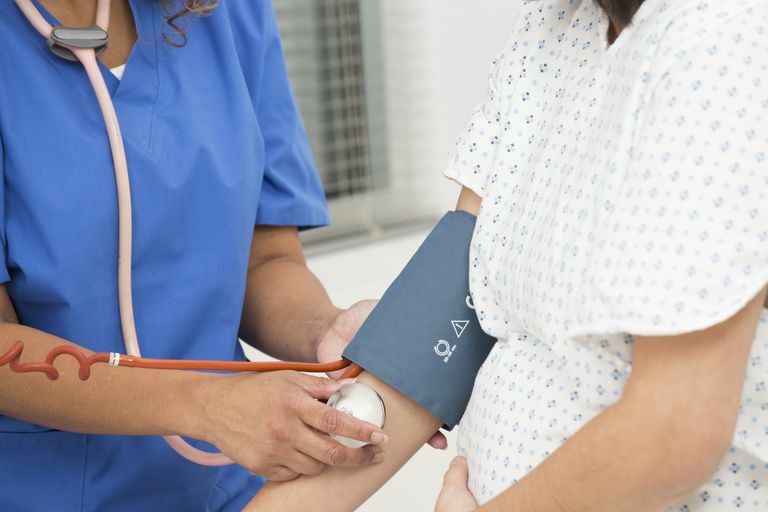 If you have high blood pressure and are pregnant or planning to be, you may be curious about the risk factors, such as miscarriage, that hypertension can pose to a pregnancy. Chronic hypertension is a risk factor for serious pregnancy complications and may increase the risk of late pregnancy loss in women when high blood pressure is not monitored and controlled. Hypertension, or high blood pressure, is a condition in which the blood exerts a higher than average amount of pressure against the blood vessel walls. Though many people can receive a single high blood pressure reading on occasion without necessarily having a problem, chronic hypertension (high blood pressure that persists over time) is a recognized risk factor for heart disease. Uncontrolled chronic hypertension also can cause problems for pregnant women. First, it's important to understand that high blood pressure is often a complicated problem. The condition might be a side effect of other diseases, such as systemic lupus erythematosus or diabetes, or it might occur without a clear cause. Blood pressure readings usually involve two numbers, a top (systolic) and a bottom (diastolic) number. The systolic number is the pressure of the blood against blood vessel walls as the heart beats, and the diastolic is the pressure against blood vessel walls between heartbeats in units of millimeters of mercury (mmHg). There are also different degrees of hypertension. According to the American Heart Association, a top number between 140 and 159 and/or a bottom number between 90 and 99 is considered "stage 1" hypertension. Blood pressure with a top number over 160 and bottom number over 100 is "stage 2" hypertension, and systolic higher than 180 and/or diastolic higher than 110 is considered an emergency. In pregnancy, it is possible for hypertension to have a new onset during the pregnancy, in which case the condition is called "pregnancy-induced hypertension." This condition often disappears after delivery. Other moms may have pre-existing chronic hypertension before pregnancy. In either case, the risks are about the same — unmanaged chronic hypertension in pregnancy is linked to increased risk of gestational diabetes, placental abruption, preeclampsia, and intrauterine growth restriction. There is no information linking chronic hypertension to first-trimester miscarriage, but given that the above conditions are linked to increased risk of stillbirth, chronic hypertension could be considered a risk factor for late pregnancy loss. That being said, however, moms with chronic hypertension should not necessarily worry about getting pregnant. With any chronic health condition, it's important to discuss your pregnancy plans with the doctor in charge of your treatment, but regular prenatal care and monitoring can reduce the risk of adverse outcomes. Most moms with chronic hypertension will be able to have a healthy pregnancy if they attend prenatal appointments regularly and follow their doctor's advice. Note that if you become pregnant while taking blood pressure medication, you should make sure to notify your doctor right away as some blood pressure drugs (such as ACE inhibitors) can be harmful during pregnancy. Never stop taking any medication unless a doctor advises you to do so, but do make sure that you talk to your doctor as soon as possible to make sure your medication isn't considered risky. Ferrer, Robert L. MD, MPH; Sibai, Baha M. MD; Mulrow, Cynthia D. MD, MSc; Chiquette, Elaine PharmD; Stevens, Kathleen R. RN, EdD; Cornell, John Ph.D. "Management of Mild Chronic Hypertension During Pregnancy: A Review." Obstetrics & Gynecology: November 2000 - Volume 96 - Issue 5, Part 2 - p 849-860. Livingston JC, Maxwell BD, Sibai BM. "Chronic hypertension in pregnancy." Minerva Ginecol. 2003 Feb;55(1):1-13. Ray JG, Burrows RF, Burrows EA, Vermeulen MJ. "MOS HIP: McMaster outcome study of hypertension in pregnancy." Early Hum Dev. 2001 Sep;64(2):129-43. Understanding Blood Pressure Readings. American Heart Association. Accessed: 14 Feb 2010. Karin Zetterström‌1, Solveig Nordén Lindeberg, Bengt Haglund and Ulf Hanson‌. "Maternal complications in women with chronic hypertension: a population-based cohort study." Acta Obstetricia et Gynecologica Scandinavica 2005, Vol. 84, No. 5, Pages 419-42.